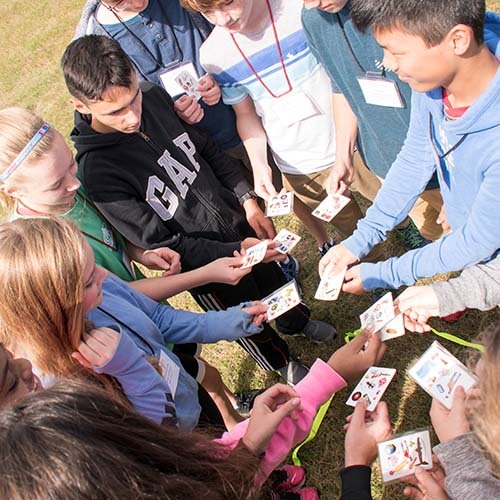 Trinity College School’s Grade 9 students had an afternoon of fun and friendship on Friday, September 8th, as they took part in their annual day trip to start the school year. This year, students and faculty chaperones headed north of Port Hope, to Canton, where they were met by facilitators from Adventureworks! The facilitators hosted several activities that helped students bond with their classmates and make new friends, and to get to know their teachers better. The students took part in “getting to know you” games, and activities that encouraged teamwork and leadership. In keeping with the School’s academic goals, the events also helped to develop skills of communication, creativity and critical thinking, explains Luke O’Connell, Grade 9 coordinator. For example, students worked in groups using a variety of materials to create a protective casing for an egg that they then launched from a catapult. Students were excited to see if their creations kept their egg safe on its journey! After a busy afternoon, students and their teachers headed back to campus for a special Grade 9 dinner in Osler Hall, including lasagna, shrimp stir-fry and salad, topped off with a “Welcome to Grade 9” cake. The future Class of 2021 has had a great beginning to the new school year and we look forward to seeing their many contributions to life at TCS over the coming year. Visit the Grade 9 Day Trip ’17 gallery for more photos.